This year has turned out to be a great year for flying for me. I have flown more total hours, solo hours and cross country hours since the year I earned my ticket (2004). I am slowly building up more cross-country experience, something that will come in handy if I begin to pursue an instrument rating. Yesterday, I logged another 1.7 of cross country time. I knew I had the plane for about two hours so I unfolded the sectional and looked for airports that were more than 50NM miles from Sturgeon Bay Cherryland Airport but also not too far that would prevent me from getting a preflight completed and get to my destination and back in the two hour time slot. The airport that best met those criteria was New Holstein Municipal Airport in New Holstein, Wisconsin. 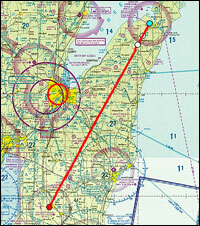 The airport is just over 60NM from Cherryland just a few miles to the East of Lake Winnebago. Shortly after departing from Cherryland Airport I tuned into Green Bay Approach and as expected it sounded pretty quiet so I figured they would have capacity to provide me with flight following. I hit the transmit button and said "Green Bay Approach, Cessna 378MJ". After their response I responded with "378MJ, Cessna 172 is 10 miles southwest of Cherryland KSUE at 4,500 requesting flight following, direct to New Holstein". They provided me a squawk code then verified my radar contact. From that point forward I only heard from the two more times. The first was to point out traffic at my 10 o'clock which was no factor and the second time was to terminate flight following as I approached my destination. Although, they did not provide much support I always prefer to take advantage of flight following to provide an extra layer of safety. Although, the airplane was GPS enabled I planned the flight the old fashion way with dead reckoning. I noted small towns, windmill fields, a river and a racetrack as several good landmarks for the flight. I arrived at each checkpoint close to my planned time of arrival and almost directly on target. Any easy task yesterday as the winds aloft were very light. There was no activity at New Holstein when I arrived. Since they don't have an automated weather system I overflew the field to check out the windsock. I found the windsock to be limp. New Holstein has both an asphalt and a turf runway. It appeared from the windtee and the way the limp windsock was situated and based on weather from a neighboring airport that runway 32, the paved runway, would be my best option. I flew through the pattern and landed smoothly then back taxied for to the end of the runway for departure. The return flight was a little quicker due to a slightly better support from the winds aloft. I again leveraged the support of ATC for flight following. 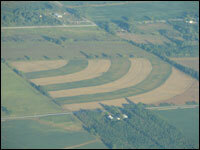 Flying over a vast area of farmland I saw some interesting shapes cut into the corn fields and other crops below. Designs that you would miss if passing these areas by car. I saw one design that looked familiar then I realized it was because it reminded me of the RSS feed icon. In the end it was another fun afternoon of flying over Wisconsin in the Cessna 172. I flew up to Ephraim last weekend. It was my first trip to Door County, but it won't be me last. Glad to hear you enjoyed your visit to Door County. Ephraim is a great little airport. That's funny. I was scrolling through your posts, and I saw that field and that was the first thing I thought of too! Does that confirm I spend too much time on the computer? It would be interesting to do a poll and see how many pilots realize the resemblance of the field to the RSS icon. My guess is, not many.